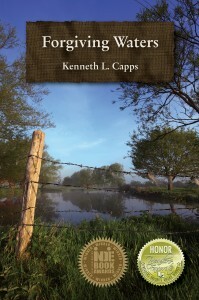 Read this glowing review for Kenneth L. Capps’s Forgiving Waters. Bo (Beauregard) Kelso is an old man, a wealthy Texas rancher who has outlived his beloved wife, Mary Beth, by three years. Seventy-three years have passed since Bo’s intolerant, hateful father Leroy nearly hanged his black ranch hand, Calvin Mercer, for attempting to steal what turned out to have been a bag filled with food for his hungry family. Bo knows that his background of racial intolerance caused by his father has caused terrible problems in his past and he grieves over what he’d done back in 1942. He has given anonymous gifts to local needy causes, but Pastor Clover tells Bo that giving gifts to church doesn’t make a person right with God. Bo now rides his beloved horse, “Whisky By The Drink”, all over the acres of his ranch, but when he comes upon young teenagers Kevin and his friend Leonard, one white and the other black, fishing on his property, he knows just what to do. And with the help of his ranch manager, Clint, whom Mary Beth rescued years before, Bo succeeds. “Forgiving Waters” is a highly readable and very well-written and edited story of a man’s life. Bo Kelso is a wonderful literary character as are Clint, the boys Leonard and Kevin, their parents, Matt with his shortcomings, Elijah Waters, and Bo’s loved wife, Mary Beth. Readers will not be able to put this story down until its last page as “Forgiving Waters” is just one of those literary works that will penetrate the reader’s heart and mind as its plot runs smoothly to the story’s final words. Kenneth Capps has created a monumental story as big as the state of Texas where it is set. Put this book at the top of your reading list, everyone out there! Forgiving Waters is an award winner!